15 Types of Screeners And How To Work With Each One! Definition: When you encounter this type of screener you can forget about getting through to your sales prospect. Basically, you have no chance of being transferred or getting any type of information from the screener. Your Solution: Your best strategy is to locate the email address of your prospect. When you email your prospect include a compliment about their screener such as �(Name of screener) is an excellent at their job because no matter what I said (he or she) would not let me through to you!� Also, in your email, note that you are very determined to speak with them and give a brief explanation why they should give you a few minutes of their time. Definition: These type of screeners usually take a message on a piece of scrap paper and eventually it gets lost on their desk. One day they will find it and say to them self, �I thought I gave this to (Name of your prospect), I think I will conveniently throw it away, I don�t want to look bad, do I? Your Solution: These type of screeners are really not protecting their boss so you don�t have to worry about any type of resistance from them. A majority of the time if they are taking a message for you then odds are that your prospect doesn�t have a voicemail machine. Try asking for the prospect�s cell phone number. Definition: You�re better off just not leaving a message with this type of screener. Their famous line is the following: �Yeah, ok, I got it, thanks!� They are pretending to take a message and you are just fooling yourself into believing that your prospect will get it because the reality is they don�t care. Your Solution: Since they don�t care they will give you as much information as you request. This is your chance to find out what supplier your prospect may be using, who they report to, their email address and their cell phone number. Definition: This is one of the best types of screeners to speak with by telephone. They are very sincere, very savvy and they probably have been with the company for many years. If you have called more than two or three times they will respect your persistence and really make a solid effort to get your message to your prospect. Your Solution: These are the type of screeners that you should be sending thank you notes to. If you manage to send them a thank you card then you have won yourself a new friend the next time that you call! Definition: Talk about personal problems. These types of screeners are given an A+ for bringing their personal problems into the workplace. They will raise their voice or even yell at you when speaking with them. Your Solution: Your best option is to visit your prospect�s company website and see if they list their email address so that you can contact them directly. Definition: These type of screeners have an excellent sense of smell. 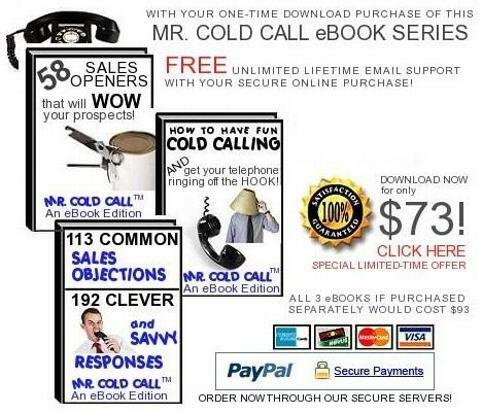 As a result of answering so many phone calls each day they know instantly that you are trying to sell something. And because of their keen senses they reject you instantly. Definition: If you push this type of screener too far they may mention that they will contact the Federal Trade Commission so be very careful here. As a side note, if you are contacting someone at work, there are no laws that prevent you from making business to business telephone calls. The Do Not Call Lists applies only to business to consumer telephone calls. Your Solution: See solution #5. Definition: This type of screener is the same as The Not Interested, The We Are Fine And Oh, It�s You Screener. Your Solution: See solution #6. Definition: This type of screener has been told by their boss to specifically have people contact them in writing. Many sales reps when they hear this decide that it�s better just to move on to their next prospect. The odds that your letter or fax will be read is slim to none. Your Solution: Try sending a letter by Fed-X for next day delivery. Or, send a talking telegram to really get their attention! Definition: There are actually two types of �What Is This Call Regarding� type of screeners. There is one type of screener that is really trying to help you and then there is another type of screener who may ask you a million questions. Their primary objective is to be nosy. Your Solution: If you are dealing with the more helpful type of screener in this example then check out solution #4, however, if you are dealing with the nosy type of screener then politely ask when the best time to reach your prospect is? Definition: This type of screener works for a very successful business executive. An example of this type of screener would be a screener that works for a high profile CEO. Your Solution: See solution #9. Definition: This type of screener is happy with their personal and professional life and they will let you know it. They are very easy to deal with and show no signs of resistance. Your Solution: See solutions #3 and #4. Definition: This type of screener is temporarily filling in for the full-time screener. Your Solution: See solution #3. Definition: If you know more than one language than you will have no problem with this type of screener. If you don�t then good luck! Your Solution: It�s time to start learning another language, can you say Berlitz? Definition: This is my favorite type of screener. In the middle of your conversation you will find yourself talking to yourself because the screener just disconnects the call. You could be the President it doesn�t matter. Your Solution: Your best bet is to just move on to your next prospect.